~Jo's Scrap Shack~: Cardz TV Challenge #20 "To Die For"
Cardz TV Challenge #20 "To Die For"
Start with a 5 in a half inch by 12 inch piece of paper. Score at 4 and a quarter inches, 8 in a half inches and 10 and a quarter inches. That's it! Easy Peasy! Okay so my card base is from Bazzill and the patterned paper is from the Free Bird Comfort line by Authentique. I inked up the edges and the scalloped circle using some Tim Holtz walnut stain distress ink. 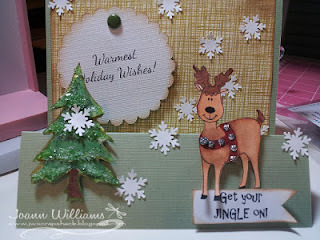 My reindeer is a stamp that I purchased from Great Impressions Stamps and colored using my copics E07, E51, E53 and E57. I used some silver stickles for his jingle bells. The tree stamp was a steal that I got from Michael's a long time ago for a dollar. I colored this in using G21, G24, G28, E27 and YG81. I added some "diamond dust" glass effects to give the look of fresh fallen snow. 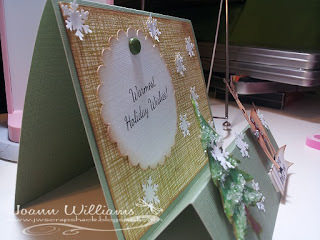 I then used my Martha Stewart snowflake punch using more of the white GP cardstock to create a snow scene. I really like how this card turned out. Well that is all I have for you today and I hope you give this challenge a try. You can link up your creation below. Also if you would like to purchase some Cardz TV Stamps instead of waiting to see if you are a lucky winner, you can by going HERE. Don't forget to become a follower of my blog and enter yourself in my 200 Follower Giveaway! Have a wonderful and crafty weekend! You did a great job. Great fold. Great step card! Love your blog! I love the reindeer! I love the stickles for his bells. So cute!Great job! love the unique fold and pretty details. beautiful card, Jo! Love the side step card.